Akimbo assault rifles, 1440p Ultra settings, and shooting lots of Nazis in the face—these are all things the Large Pixel Collider, our all-powerful supercomputer, heartily approves of. That's why we ran B.J. Blazkowicz's latest adventure, Wolftenstein: The New Order, with all the settings cranked to the max. Sit back, set Youtube's bitrate to 1440p, and enjoy seven minutes of old school FPS action. 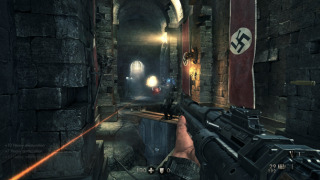 Wolfenstein: The New Order isn't the first game we've fed into the LPC, only to receive glorious 1440p gameplay in return. So far, we've hit the Titanfall beta, Max Payne 3, Metro: Last Light, and Arma 3 . There's much more to come. Have a game in mind you'd like to see the LPC take on at Ultra settings? Tell the LPC directly on Twitter.